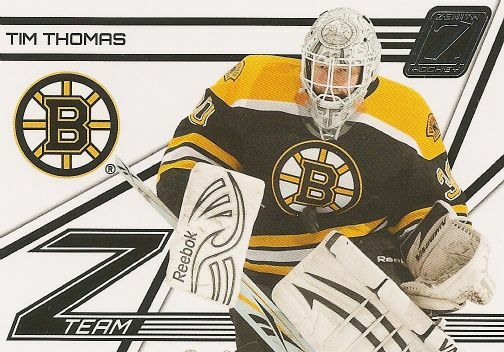 Panini brings back long lost Zenith back to the hockey card world. Does this once premium brand return to its former glory? Well, first and foremost... Zenith has not returned as the top of the line brand it started out as in the 90s. I remember when Zenith was first released - the cards were golden foiled and came on very thick cardstock. These Zenith cards are nothing like those. The brand has come back as a mid-tier product at a middle of the pack price point. The Zenith base card comes on thin, flimsy card stock and looks like it could have come from a low to mid end 90's base set. I'm not sure what happened here, but these base cards just don't do it for me. I think the best word that comes to mind for me in describing these cards is generic. Everything about this card says 'plain' to me. There's a spot for the Zenith and team logo and a the player name with a thick black border and that's it. It's not creative and the design does nothing to make these cards stand out. 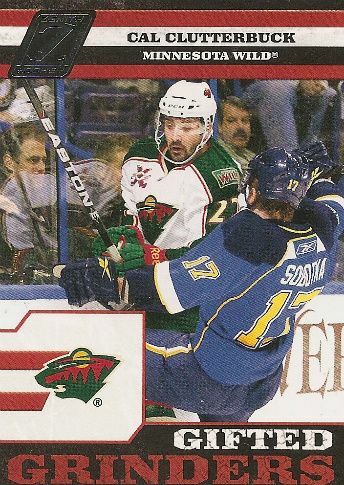 And even though the photo of the player is rather large on the card, it scarcely matters because everything else about the card is just plain boring. The backs of the cards are of the standard Panini fare - a line of stats and a short write up. I really wished Panini would have made a better effort with these Zenith base cards. Back in the day you could recognize a set by its base card. Base cards set the look and standard for the entire set. You knew if a set was great by looking at the base cards. Here, the base cards disappoint in a major way. Panini had a golden opportunity in this first in hockey to re-kick off some great legacy brands. They have done that to some extent with Score this year, but this one, Donruss, and Pinnacle have all fallen a bit short. The base set includes current stars of the NHL along with some legends and rookies. 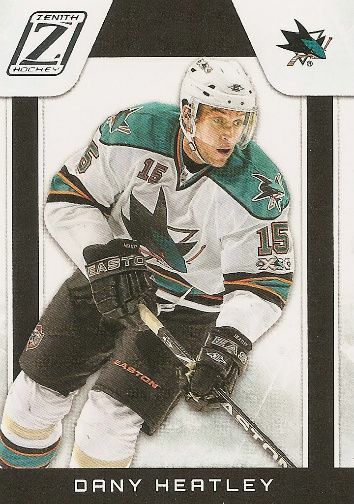 The legends cards are interesting in that Panini has chosen to show these former stars in jerseys that these stars are not typically remembered or shown in. I think this was a fun idea because I like these odd ball type things. 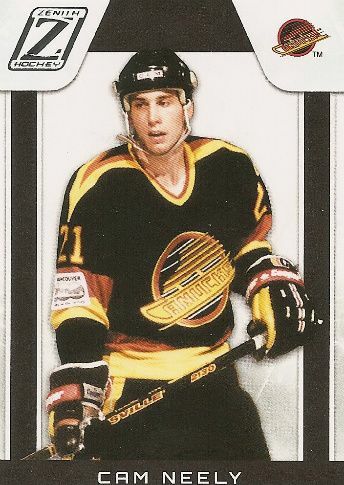 Check out Cam Neely above in that funky old school 'Nucks uni! 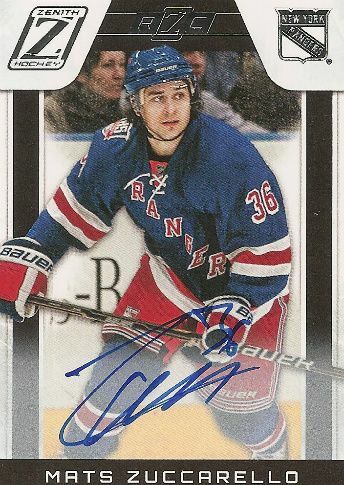 And as usually for modern day sets, the rookie cards are limited and autographed. Unfortunately for these cards and as for the legends cards as well, they share the same bland design that the all the base cards have. There are a few minor differences in the rookie card - foiled team logos and a special foil rookie card logo as well as serial numbering. Despite Zenith's lackluster base set, its insert offering is better. Zenith offers many different types of inserts, game-used, and autographed cards. Below you will see a scan of some of the inserts I pulled from my first box of Zenith. I had to use a camera to take the picture instead of relying on my scanner because the nufex foil technique Panini employs does not scan well for me. Many of the the Zenith inserts feature the nufex foiling effect. And I must say that I do like the foiling aspect of the cards. One of my main complaints about Panini has been their lack of good foil usage in many of their products. Well, here they use it very well. The nufex doesn't just add a shine to the card, it also adds some texture. The Mosaics insert features 3 players from the same team. Along the bottom portion of the card are a pattern of squares that reflect light differently creating a very cool mosaic effect. It's a pretty card but for one thing... if you look at the Mosaics card I pulled of the Penguins (bottom middle), you'll notice that there is only 1 jersey piece but 3 players on the card. I'd rather have no jersey piece than one loner piece like they did on that card. The card just looks off to me. What do you think? Aside from the foiled inserts there are standard looking insert sets as well. 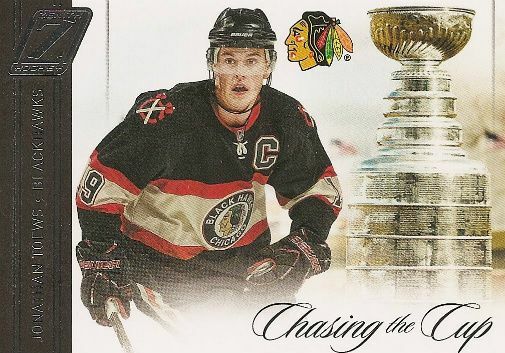 Here are a few examples from the Chasing the Cup, Z-Team, and Gifted Grinders insert sets. Insert sets like these really bring me back to the past when inserts pretty much looked like those shown above. I commend Panini for coming up with some nicely themed inserts and featuring players that might not otherwise get an insert card (like the Cal Clutterbuck card and others in that particular set). But the downside with these cards is that collectors nowadays want more from their cardboard. I can't see these cards being very desirable at all except in player or team collections. Probably the most interesting aspect of Zenith this year has to be the Dare to Tear card that comes one per box. It is an oversized card that hides a smaller card within. Collectors can choose to keep the big card or rip it apart and see what regular sized card is inside. There are some pretty nice cards you can obtain by ripping the big card so I would not hesitate to tear and see. If you'd like to see me rip mine apart you can by checking out the video at the bottom of this post. I got a Tony Esposito Dare to Tear jumbo card... it got turned into... well... you'll just have to watch and see! Zenith is a very interesting product from Panini. Though the base cards have much to be desired, the inserts and fun you can have might make it worth a purchase. Zenith falls squarely into the mid-priced product range with boxes going from $80-$100 so it won't set you back too far. I definitely would not recommend buying packs because the potential to get all base or just jersey is too high - and you would have no chance of ripping the Dare to Tear card. A box or boxes is the way to go! All in all though, I don't think this year's Zenith stand out in the long run. So buy a box or two and wait for the big boys to come out soon! Check out what I got in a box of Zenith and watch me dare to tear!